This homepage is the outcome of a hands-on university seminar on the digital online presentation of the Rosetta Stone. It is a cooperation of the German Excellence Cluster Topoi and the Department of Archaeology of the Humboldt-Universität zu Berlin. For this project, the project leaders and the seminar participants combined their expertise in Egyptology, Ancient Greek Linguistics, General Linguistics, and Computer Sciences. A kernel part of the homepage is a full linguistic analysis of the trilingual text on the Rosetta Stone. However, it also seeks to present interesting information for a non-academic reader. The homepage is still under development. Move the mouse over the image to highlight parallel sections. Klick to go to its linguistic analysis. What does this homepage provide? Sentence translation(s) (English and German). Klick here for an EXAMPLE. We are happy to receive your comments on the homepage or on specific analyses. Please use the respective commentary fields. 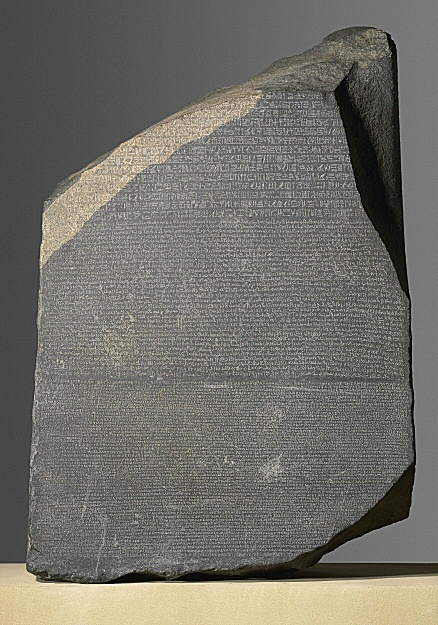 Cite this site: The Rosetta Stone Online project, ed. by Daniel A. Werning, Eliese-Sophia Lincke, http://hdl.handle.net/21.11101/0000-0001-B537-5 (accessed: _____). Project coordination: Eliese-Sophia Lincke, M.A., Dr. Daniel A. Werning, Dr. Thanasis Georgakopoulos. Website content: Daniel A. Werning, Eliese-Sophia Lincke, Thanasis Georgakopoulos, Tobias Paul, Marcel Gördes, Lisa Seelau, Maxim Kupreyev, Kerstin Weber, Florian Kirschner, Ilya Burow, Dora Ehrensperger, Andrea Magliocchi. Website administration, IT, and Digital Humanities workflow: Dr. Daniel A. Werning.